You may recall me recently extolling the virtues of replacing expensive industrial PDA/Pocket PC devices with a dual-mode mobile phone equivalent? See The Lure of Dual-mode Mobile Phones - 15 Jan 2009. Always one to take the bull by the horns and prove (or disprove) a theory early on, I got together with the Tesco.com developers who created the 'REACH' application for drivers to see if we could make this application work on a phone. REACH is an application that runs on an industrialized Pocket PC that drivers use to help them deliver to customers - basically an electronic version of all the paperwork that the driver had to carry previously. The on-screen display shows customers in their order of delivery, and products for each customers. The driver can use REACH to inform the customer of any substitutions, and scan a product if the customer rejects it so that when the device gets back to the store, a refund can be enacted straight away. REACH is short for Retail Excellence At Customers' Homes. Yes I thought that one up, being responsible for the original drivers' handheld-device project (fear not, I am kept far from the marketing department!). If you shop with Tesco.com grocery, you will have held a REACH device in order to sign for your delivery on its screen. The developers and I have given ourselves a mission: to recreate as much of the functionality of REACH on a Blackberry mobile phone as we can. This involves learning the Java programming language (which, apart from some anomalies, is very similar to the Microsoft C# language we use for development everywhere in Tesco.com). Research In Motion (who make the Blackberry) have kindly provided a complete emulator of a Blackberry phone which runs as a Windows application. The emulator has nearly all the features of a real Blackberry (except being able to make calls!) and we're using the Eclipse interactive development environment to write and test the Java code. The 'closeness' between C# and Java has meant that at times the developers have been able to lift out great chunks of REACH application source code and re-use them with minimal syntax adjustments. That in itself is a great outcome of building the prototype. There are two other challenges - how do we re-create the customers signing for their deliveries? We're looking at getting the customer to sign on their own receipt and then using the phone to photograph the signature. As for scanning barcodes, a variation of the Tesco@Home webcam barcode-scanning algorithm is likely to star again. But the biggest fun is yet to come: our aim in March is to convert our CEO Laura Wade-Gery and the rest of the Tesco.com leadership team into 'drivers' for a morning. We'll demonstrate what has been possible by getting them to take out their Blackberry phones, connect to the office Wifi network, download the Java application, each select a van-trip from our test server, then 'go delivering'. The image above has been created from examining all the words in my blog and feeding them into a web site called www.wordle.net which has counted all the words and, where there are more instances of a word, made them relatively larger. 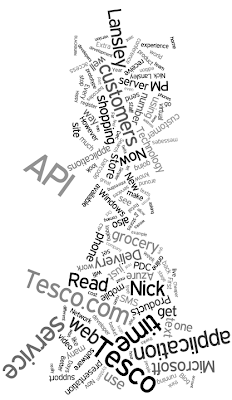 Wordle has then added the words into an interesting graphical pattern. Have a go yourself using the link above.